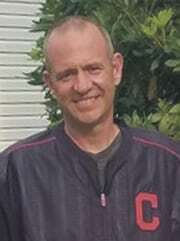 Vincent “Vinnie” Massa, 46, of Warren, PA., died Monday morning, August 20, 2018 at the John and Orpha Blair Hospice Home, after a courageous battle with cancer. He was born in Warren, PA., on January 3, 1972 to Stephen and Nancy Ballard Massa, surviving of Warren, PA. Vinnie was a 1990 graduate of Warren Area High School and Slippery Rock University with a Bachelor’s Degree in Spanish. He was employed as an assistant to the Superintendent with the Warren Public Works department for 20 years. He was a longtime member of the Warren Elks Lodge, American Legion Post 135, Struthers Hose and Eagles Club. He was an avid golfer, Cleveland Browns and Indians fan, Ohio State Buckeyes Fan. He is lovingly remembered by friends and family, as a man of great integrity, who was kind, a wonderful son, husband, father, brother, who inspired numerous people. In addition to his parents, he is survived by his wife, Amy R. Massa whom he married July 7, 2017 in Warren, Pa.
1 Brother – Michael S. Massa and wife, Shelly of Warren, PA., 2 Sisters – Kelly Burger and husband, John of Broomhall, PA., Kendra Pantuso and husband, Bill of Bradford, PA., his father & mother in laws, Ronald and Penny Bosworth of Pittsfield, PA., 1 Brotherinlaw, Ronald Bosworth, II and his wife, Gina of Omaha, NE., several nieces and nephews. Friends may call at the Donald E. Lewis Funeral Home, Inc., 304 East Street, Warren, PA. on Wednesday, August 22, 2018 from 1 to 3 and 6 to 8 P.M. A funeral service will be conducted Thursday, August 23, 2018 at 11:00 A.M. at First Lutheran Church with Rev. Jeffrey Ewing, Pastor, officiating. Interment will be in Pine Grove Cemetery, Russell, PA. The family requests that all in attendance of visitation hours and funeral service come in any DPW dubs, Sporting or V shirts. Those wishing to place memorials may do so through Hospice of Warren County, Earmarked solely for the John and Orpha Blair Hospice Home, 1 Main Street, Warren, PA., 16365 or John Hopkins Research Center, P.O. Box 17029, Baltimore, MD 212971029 Email condolences may be sent by visiting www.lewi sfuneralhomeinc.com.